During the Bologna follow-up group which was held in Luxembourg in September 2015, the work-plan for 2015-2018 has been adopted by the members. Taking into account the new challenges, on the basis of the Yerevan communiqué and the BFUG and Board's preparatory work meetings, this renewing EHEA vision has given rise to the next triennial BFUG working plan: it will be a restructured organization, giving a broader place to the national stakeholders The work plan gives the main lines for the next three years establishing the topics of each working groups and advisory groups. Members were invited to announce their interest to participate at the working/advisory groups and to propose activities where needed. The working group "Monitoring" is continued from the previous period. A new working group is focused on "Implementation: Fostering implementation of agreed key commitments". The third working group "New goals – Policy development for new EHEA goals" is dedicated to new priorities for the future. "EHEA international cooperation" includes the preparation orf the Bologna policy forum in order to enhance the international dimension. "Support for the Belarus Roadmap" co-operates with the national authorities of Belarus to help them in implementing the overarching principles of Bologna process/EHEA. "Dealing with non-implementation" is mandated to facilitate national ways of aligning with the Bologna key commitments. "Revision of Diploma Supplement" is responsible for producing a renewed version of the Diploma Supplement so as to ensure its efficiency. A Drafting Committee was set up in the Spring 2017. It is entrusted with the responsibility to prepare the draft of the Paris Communiqué. 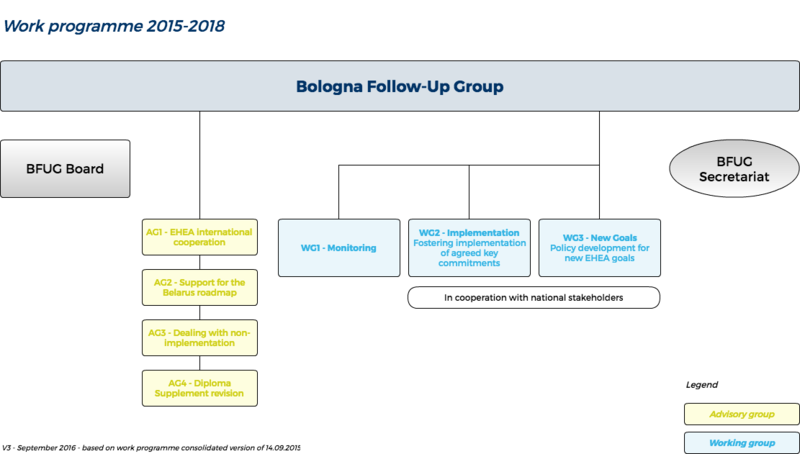 This document outlines how the Bologna Follow-Up Group (BFUG) was operating for the 2015–2018 period, in terms of structure, meeting management and communication. The provisions set out in this document are not to be considered as strict or definitive rules, but as guidelines for the BFUG proceedings and its sub-structures (the Board, Working Groups, Advisory Groups and the Bologna Secretariat).